Beautiful lips can enhance your look and transform your face to give you immeasurable confidence. With our help your lips will enhance your facial features, making you look more youthful. The treatment should take no longer than 30 minutes from consultation to actual treatment. Because our lips are so active, fillers are especially created to match the lips’ natural structure, supporting their many movements in everyday use, sustaining definition and enhancement over a period of up to 1 year. At Nu, we use the most advanced lip filler products available. Juvederm Smile® gives softer, more natural looking lips than traditional lip fillers. Plus, it has the additional benefit of a slight anaesthetic within the formula, meaning less pain and discomfort during the procedure. Other products may be available on request. Firstly, we cleanse the area to be treated and then we will anaesthetise the lips, numbing the area to be injected. A series of small injections apply the filler. The dermal filler is then applied via a series of injections and is massaged into place to ensure evenly distribution. This takes no longer than 30 minutes from beginning to end. Instant results are achieved with possible slight swelling at the points of injection, but this will subside within 24-48 hrs. There may be some slight bruising, but this is normal and is superficial usually leaves within 24-48 hrs. Your lips will have volume and definition for up to12 months, but generally last approximately 8 months. Nu Cosmetic Clinic have highly qualified nurses and doctors who perform lip enhancements at various locations throughout the UK. Lip filler treatments have been made a viable option for many more people due to Nu Cosmetic Clinic’s affordable lip filler costs – contact us for details. The procedure normally takes 20-40 minutes. The effects of lip fillers normally last up to a year. The procedure can be uncomfortable, so local anaesthetic is normally used in the area. Most clients only require one session to achieve the desired results. Some people choose to have occasional top-ups to maintain the look. When can I go back to normal day-to-day activities? You can go back to normal activities the same day. Though we recommend you avoid excessive heat for about two weeks after (e.g. sunbathing, sunbeds, saunas). There may be some bruising in the area so you may want to consider this if you are planning trips away or special days. Are there any alternatives to this procedure? Some lip glosses and gels claim to give a temporary plumping effect, however the results are minimal and last for a very short period. For a more permanent effect, lip fillers are the only option. Can I combine this procedure with other procedures? Yes, many clients choose to have fillers at the same time as other procedures. Are your practitioners suitably qualified and registered? All of our practitioners are registered with relevant professional bodies and are hold all required specialist qualifications. Please feel free to ask your practitioner about his or her experience and qualifications; they understand and support that this is vital information to your decision making process. Nu Cosmetic Clinic offers referrals to a range of locations across the UK. Rebecca is 31 year old professional. 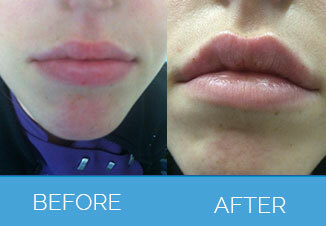 She recently underwent the application of fillers to her lip area (Vermillion borders). Having smoked for many years in the past (and having finally quit) Rebecca was increasing more aware of her appearance, and smaller ‘tell-tale’ smokers lines that had appeared around her mouth and lip area over the years. Her treatment was completed within the hour at the Rodney Street premises. A series of filler injections were directed into specific areas around her lips which are used for advanced lip enhancement treatment, so a natural result could be quickly achieved. Having no real corresponding ‘down time’ meant Rebecca was able to continue her day without disruption. After care provision consisted of being cautious with any post sensitivity of the lip area for the following few days and any swelling (if it had occurred) would also reduce to a normal level. A future consultation would merit whether Rebecca would need additional ‘top ups’ to maintain the level and quality of her result. And the end result? Another delighted client and successful procedure “I would definitely come back and recommend Nu Cosmetic clinic to any of my friends.” We will look forward to welcoming Rebecca back for her next treatment in the future. Watch Rebecca’s testimonial here. Any form of cosmetic enhancement is very personal, so prices are bespoke dependent on your individual needs. As a rough guide, you can expect to pay from £195 onwards. A definitive price for your procedure will be given at your free consultation with your cosmetic surgeon or relevant specialist practitioner. Remember, we often have offers & can sometimes price match other providers, so call us on 08000 30 29 30 with any queries. Nu Cosmetic Clinic offers a range of finance options. For more information visit our finance pages.